Things came to a head during a massive storm on Thursday’s episode of Grey’s Anatomy, aptly titled “Blowin’ in the Wind.” The building love triangle between Meredith (Ellen Pompeo), DeLuca (Giacomo Giannotti) and newcomer Link (Chris Carmack) hit a peak moment that will surely have major consequences once the season returns from its mid-season hiatus. As reported by E! News, DeLuca confessed to Meredith, “I’m not sorry I kissed you at the wedding ’cause it’s all I’ve been able to think about ever since.” He also said he thought she could feel the spark between them, too. Meredith didn’t confirm or deny his claim, but she said she’d think about it. Then, in true Grey’s Anatomy fashion, they got trapped in an elevator together. Since it’ll be several weeks before we find out what happened in that elevator — Grey’s won’t return until 2019 — we’re all on the edge of our seats about this whole situation. Speaking to E!, Giannotti said he won’t reveal any secrets but did admit that “the train is definitely moving forward” for both DeLuca and Link. 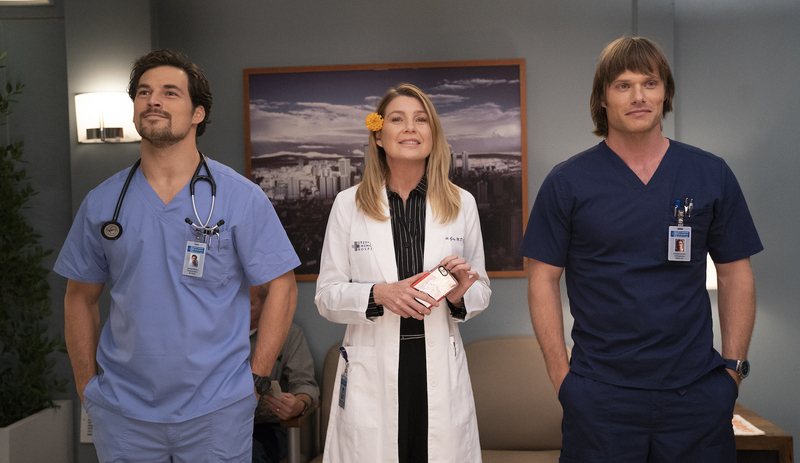 Ahead of the season 15 premiere, showrunner Krista Vernoff teased that this is the “season of love” and that Meredith will face some complications in her dating life. That certainly seems to be the case with both DeLuca and Link vying for her affections, though Giannotti thinks the whole thing is really fun to play with. There’s been no official announcement of when Grey’s Anatomy will return with new episodes in January, but we’re crossing our fingers that it’s sooner rather than later. We want to know what happened in that elevator! Meanwhile, fans can continue to watch repeat episodes on Thursdays at 8/7c on ABC.